Skin and pound the chicken breasts till thin. Lightly season the chicken breasts on both sides with salt and pepper, and then dust them with flour. Dip the floured chicken breasts in the beaten egg and finish by coating them in the seasoned breadcrumbs. A good glug of olive oil in a hot frying pan and saute the escalopes till golden brown – this takes aprox 2min on each side. Leave the cooked chicken breasts on some fresh kitchen towel for few minutes to drain, then move them to a baking tray. Put them in the oven to cook for further 5 min. 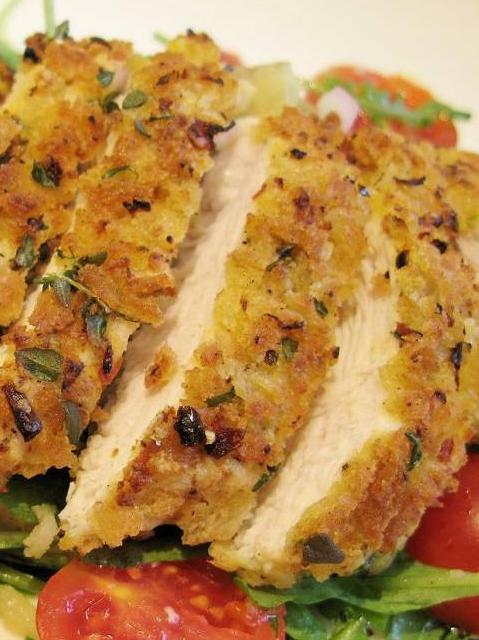 Slice the chicken into strips and serve with a nice salad.